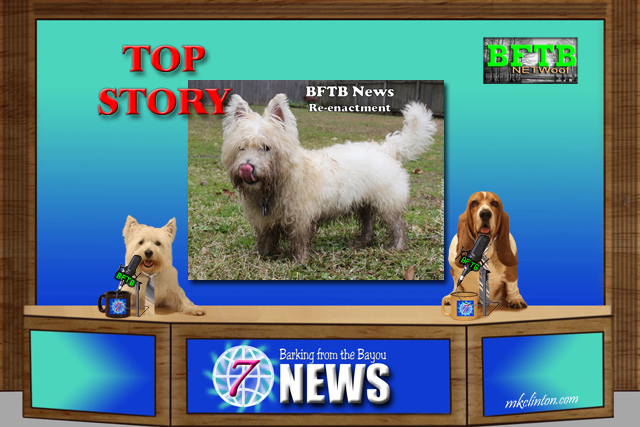 Pierre Westie: “Thanks, Bentley and it’s great to see all of you today. As you know, we love sharing sweet stories about pets and other creatures from the animal kingdom and this is definitely a heart-warmer. A search & rescue dog was called out Saturday in Washington state after a dog had disappeared on a trail ride and was missing for two days. The owners contacted an organization called Useless Bay Sanctuary where dogs help locate other missing dogs. Pierre: “There is no denying that it is really hot this time of year. 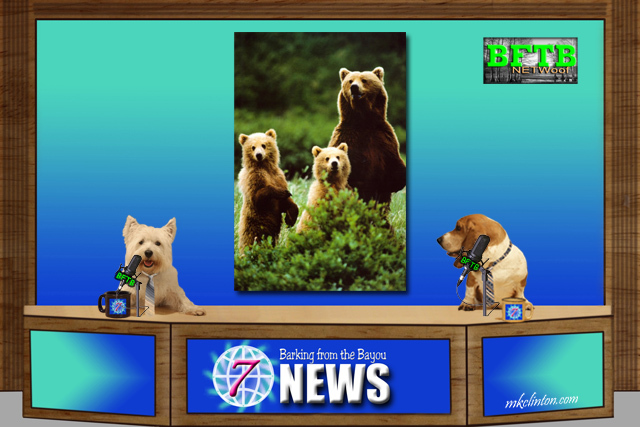 One furry family found it downright unbearable! Bentley: “There are a lot of animals searching for relief from not only the heat but the ferocious fires in California. The Carr fire near Redding took over during the night and left families only a few minutes to evacuate. 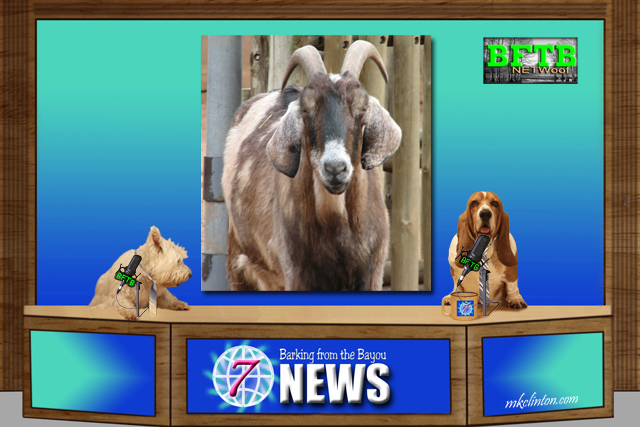 One family of four fled with their four dogs but were forced to leave their beloved goat, Milkshake behind. Not that they didn’t try, but he was too spooked to capture. They left him with a pool of water, the hose running and the sprinklers on in hopes of Milkshake surviving. 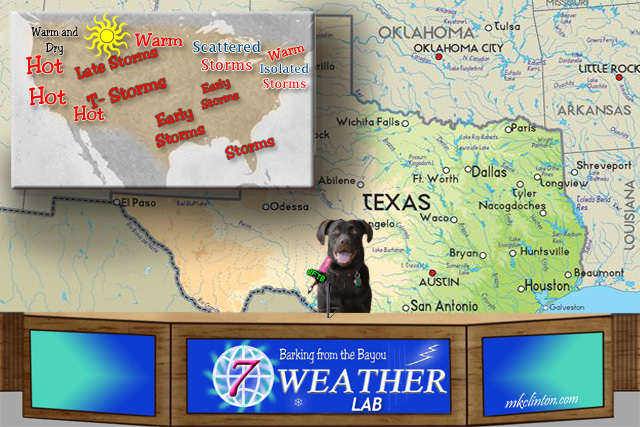 Paisley the Weather Lab: “I wish there was better news in the forecast. Most of the United States will have rain except for the place that needs it the most and that is California and the rest of the East Coast. The extreme heat is not going to help curtail the devastating wildfires in that area of our country. At last count, there were 20 different fires burning. Please stay safe and remember the wildlife will also be fleeing the areas so watch out for them in your neighborhoods and on highways. Wow! When I forecasted rain in the northeast, I didn’t realize it would be quite so much! This week will be better, but you still have some scattered storms to deal with. As I said, most of the country will have storms travel through their area at some point this week. The other exception is the Pacific Northwest and some of the northern states who will enjoy some beautiful sunny weather. Bentley: “You might remember last week when we said there was a new giveaway in the works for last Friday? 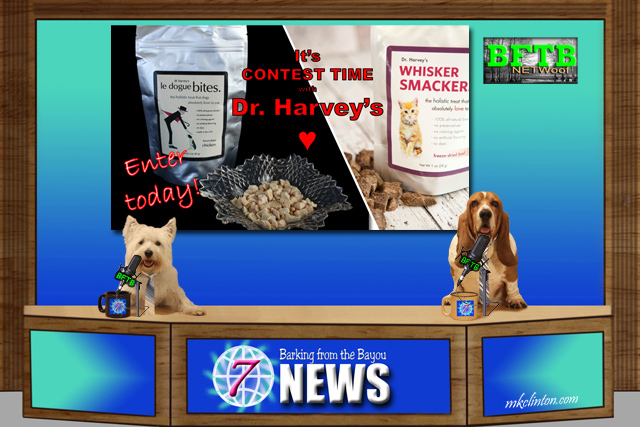 Well, we decided it would be better to start your week out with some giveaway fun so our Dr. Harvey’s Treats for cats and dogs begins today! That’s right, we are giving away a bag of Le Dogue AND a bag of Whisker Smackers for cats. Two prizes for two winners. We can hardly contain our excitement. big hugs to Tino, that was super pawsome!!!! OMD, how awful to be stuck in the mud for 40 hours! Bless you, Tino! Milkshake has the cutest name. We are so happy that he is okay! Wow, you guys are giving away something for cats? Holy smokes are you nice! Those CA fires are so scary. Hopefully they will get them under control somehow. Have a great week! We're trying to imagine that many golden retrievers in one place … Wow! I sure hope that billy goat didn't get burns on his body from the fire, 'cause that would hurt terribly. I'm so glad to hear he survived. Mom thinks that all the crazy weather we've all been experiencing is a result of humans' poor treatment of nature and the environment time and time again. I just know that it has been very H-O-T! in ORE-gon and I sure wish it would rain. Me and the doggie are melting. Winks. Lots of news there - fun, happy-ending, sad, and just feel-good. We are happy that Puppy was found. We saw a news story about the fires and saw the poor deer searching everywhere for something to forage upon with all the burnt forest areas. So sad. Oh boy, Sam and Luke are arguing over who gets to enter! We will go with the Whisker Smackers, since Luke gets more review opportunities than Sam does. She likes fish. What a great collection of stories this week, other than the fires. We are worried about and praying for the people affected by those. 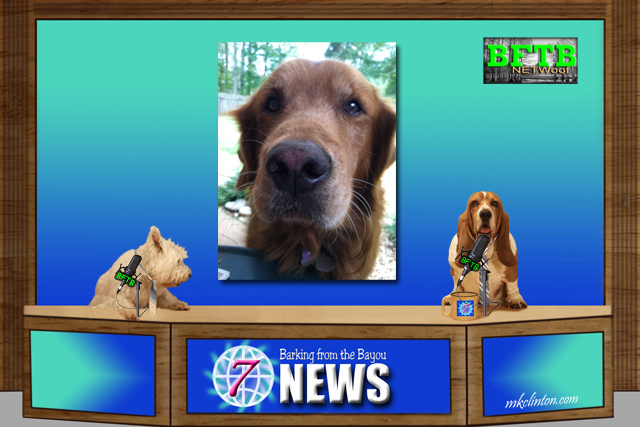 I saw a snippet on the Goldens, way cool! Can't imagine that many Golden's all in one place! I'd love the LeDogue treats for my pups. They like chicken or fish.